Gang, I have a test tonight, so my chicken mole poblano post will go up tomorrow. Thanks for your patience! I borrowed my husband’s sunglasses to finish the task. Four pounds is a lot of onion to cut up. Then I browned the onions to the desired color, described by our intrepid hostess as “poo.” I reached doo-doo color after 4 hours. The onions and stock sat in the refrigerator overnight, then I threw everything together the next day. And the soup was oddly sweet. So, I had about 4 quarts of soup, and by golly it was going to get eaten. So I threw some little mini pasta in at the last minute, hoping that the noodles would absorb some of the sweetness. It worked, and Master Chow, my honorable husband, really enjoyed it, and he is NOT an onion lover. The one thing I left off was the cheese/crouton topping. We were both getting over colds (the flu? Who knows? ), and a lot of dairy was not on the menu while we were still battling chest congestion. Now, head on over to the blogroll to see who participated and what kind of results they had. This month for Recipes to Rival, Heather chose Julia Child’s Beef Bourguignon, in honor of the new movie, Julie and Julia. Now, I took a bunch of photos, but the only one that came out was the one above. And it doesn’t do justice to this tasty dish. I’ve made it before, but I have found that practice makes perfect, and my results get better each time I make it. Read on, and I’ll share some tips with you. First, make it a day or two before you plan to eat it. The flavor improves dramatically over time, and you can skim off the extra fat after refrigerating the dish. Second, use a good wine, but don’t use a really expensive one. I’ve used expensive ones, and I’ve good, inexpensive wines. Guess which one people liked better? Third, you may need to thicken the sauce. You can either use a beurre manier (you need equal parts butter and flour, just a couple of tablespoons of each) or, if you’ve refrigerated the stew before serving it, make a simple roux in the pan before adding the stew. If you use a beurre manier, you just add bits and pieces of it to a liquid that is at a low boil, and watch it thicken. Fourth, everything cooks better if you put a piece of foil or parchment under the lid to create a tighter seal and steamier environment. Finally, I marinated the meat overnight in some of the wine, with two crushed garlic cloves and some rosemary. I think this really improves the flavor. I served this with steamed rice and a tossed green salad. To see what the other gals in the group made, be sure to check out the blogroll. Recipe after the jump. 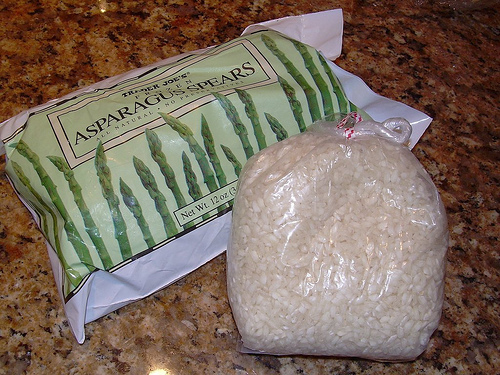 continue reading "R2R Cooks with Julia Child – Beef Bourguignon"
This month for Recipes to Rival, Debyi of The Healthy Vegan Kitchen chose Asparagus & Lemongrass Risotto by Isa Chandra Moskowitz & Terry Hope Romero from Veganomicon. She wanted to challenge us by going vegetarian and gluten free. Now, I don’t have a problem with that at all, but NO parmigiano reggiano in my risotto?! Could I do it??? Yes, I could, even though I had a little bowl of parm on hand, just in case. The one thing I did eliminate were the optional peanuts, because the thought of them in my risotto just ooged me out. What can I say? It’s my northern Italian blood talking here! I had all the ingredients on hand, believe it or not. Arborio rice and asparagus in the freezer, shallots in the pantry, and fresh lemongrass growing in a pot in the back yard. Amazingly, I did not have to go shopping for a single item on the recipe. I must say, I was pretty pleased with myself when I realized I could cook this with the food I had on hand. Heh, heh. I enjoyed making the risotto, although I did not put on relazing music or have an adult beverage as instructed by Debyi. 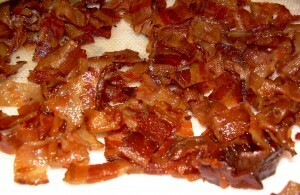 Summer on the east coast is “sweating like a pig weather,” which is exactly what I did over a hot stove. The result was a lovely, light risotto with Asian flavors, which would NOT have worked with the aforementioned parmesan cheese, so I’m glad I left it out. And if you’ve ever tried to photograph white, and ended up with a whited-out blog in the middle of the photo, you know what became of the photos of the finished dish. My risotto was still on the pale side, despite the tamari in the recipe. I really must devote some time to figuring out my new camera. But at least we’re eating well! Be sure to check out the R2R and Debyi’s blog for the recipe, as well as one she has for Tangerine Baked Tofu. This month, little ol’ me had the opportunity to choose what we made for Recipes to Rival, a group of cooks who experiment with savory dishes. For some reason that I cannot fathom, I thought posting day was July 5. The reason I can’t figure out why I thought that is because we always post on the first of the month. I blame a Brain Fart. Please forgive me! 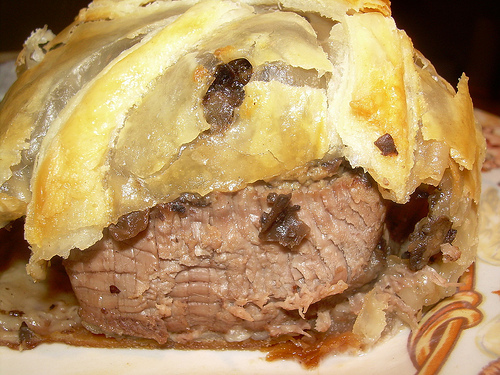 So, while I usually post something for Frugal Fridays, today I am posting my R2R pick – Beef Wellington. Now, there are a lot of Beef Wellington recipes out there, so I perused books, the internet, and magazines until I cobbled together a recipe that I thought might take the best of the bunch. Basically, the dish is made up of several components: beef, topped with a mushroom mixture called duxelles, foie gras, all of which are wrapped in a puff pastry crust. 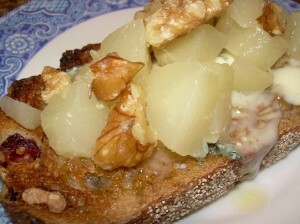 Instead of the foie gras, I used a truffle mousse that I found at Whole Foods. The beauty of this dish is that you have so much flexibility – use any protein that you like, and adjust the seasoning accordingly. If you go the vegetarian route, I suggest you use tempeh or seitan, because tofu is far too wet for this dish, and will leave the crust a soggy mess. Do not be afraid to make this dish – it is not difficult. There are three keys to making this: first, look for good beef sales, and stash the meat away for the day you want to prepare this. Beef tenderloin is not cheap, but I did manage to find some on sale for about $6.00/lb. Second, prepare the duxelles in advance. Third, mise en place – meaning, have everything prepped and ready to go when you make this. You can find a helpful Gordon Ramsey video online on how to make his version of Beef Wellington, using Parma ham wrapped around the fillet instead of the foie gras. I want to thank Lori of Lip Smacking Goodness for allowing me to pick this month’s recipe, and for gently reminding me that my post was not up! A class act, that Lori! 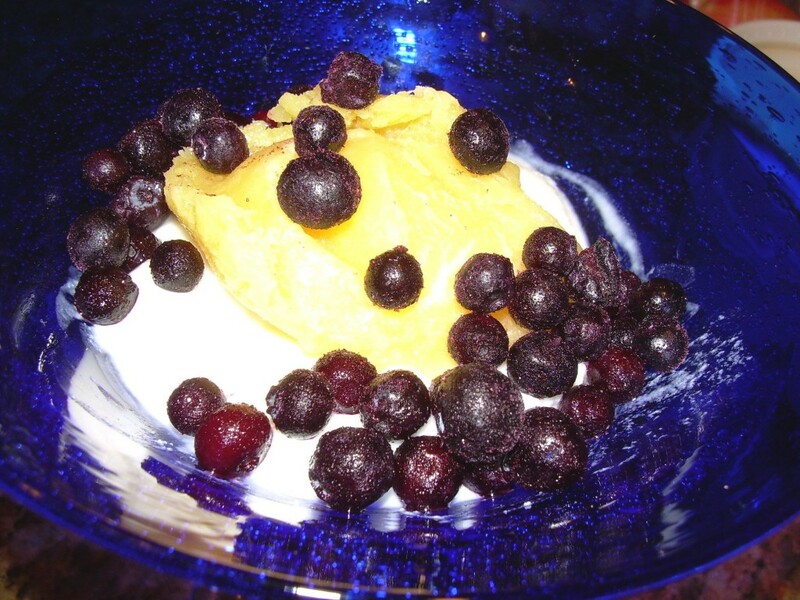 Now, please check out the blogroll to see what others did with the recipe, which you can find after the jump. continue reading "Recipes to Rival, and I’m SOOOO Embarrassed"
Please, do not be deterred by the alarming color. This food is safe for human consumption, and delicious! I’m getting this up a bit late – just got back from a two week long, out-of-town trip. Thanks for your patience with me these past few months, folks. I was hoping it would turn out to be a quiet year, but the universe had other plans for me. 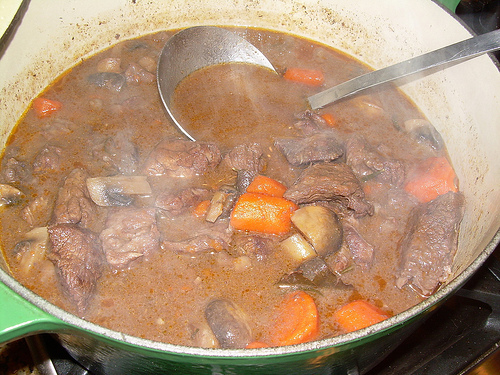 This month, Temperance of High on the Hog chose Coq au Vin from Anthony Bourdain’s Les Halles Cookbook: Strategies, Recipes, and Techniques of Classic Bistro Cooking . You can find the recipe here (my minor adaptations will be below the jump), as well as the R2R blogroll. I followed the recipe pretty much to a “T,” with a couple exceptions. First, I eliminated the pearl onions. Master Chow, my honorable husband, will not eat them, so it would have been a waste of grocery money. Second, I made the dish with chicken legs and thighs. Why? Because I’ve made coq au vin before, and despite my best efforts, the breast meat turned out dry as a bone. Temperance chose a great recipe – it’s easier than others that I have tried or looked at, and Bourdain broke it down to very manageable steps, although some of his instructions were a bit vague and required me to adapt a bit. Reducing some of the red wine amped up the flavor, and adding a bit of flour to thicken the sauce really did wonders for the texture. 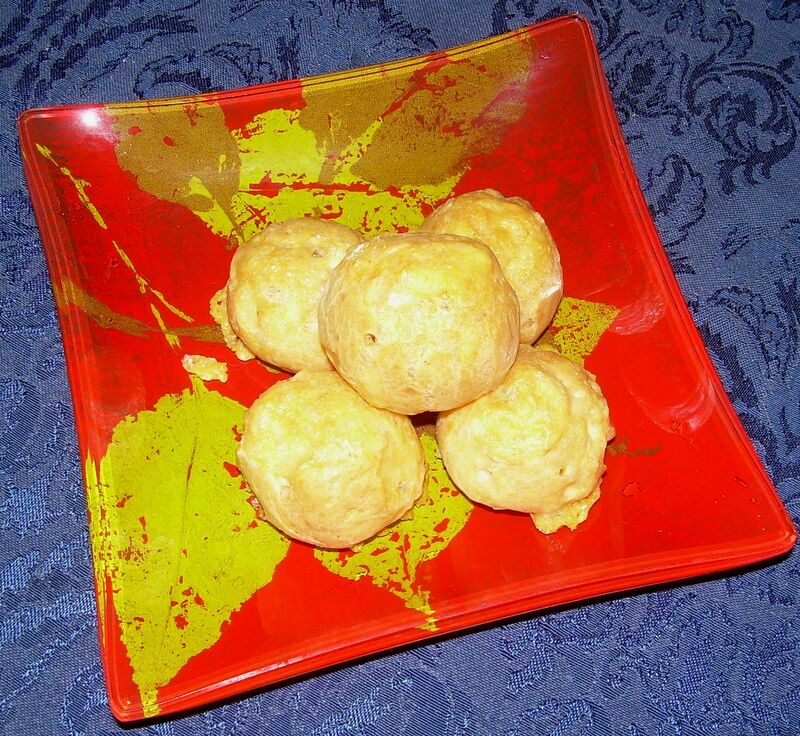 Another fun recipe from the R2R gang, and another lesson learned for me – just because you’ve made a dish before, go ahead and try it with a different recipe – the results just may be worth it! Cooking Notes: My husband really, really liked this dish – he said it was so much better than my previous attempt at coq au vin. I used Trader Joe’s Charles Shaw brand Cabernet Sauvignon, and I marinated the chicken for . . . 3 days. Yup. You read that correctly. I was so busy I couldn’t get to it, and I was afraid it had turned to mush. Didn’t happen, and I think that was because I used thighs and legs. Served it over brown rice. This is definitely on the repeat list! 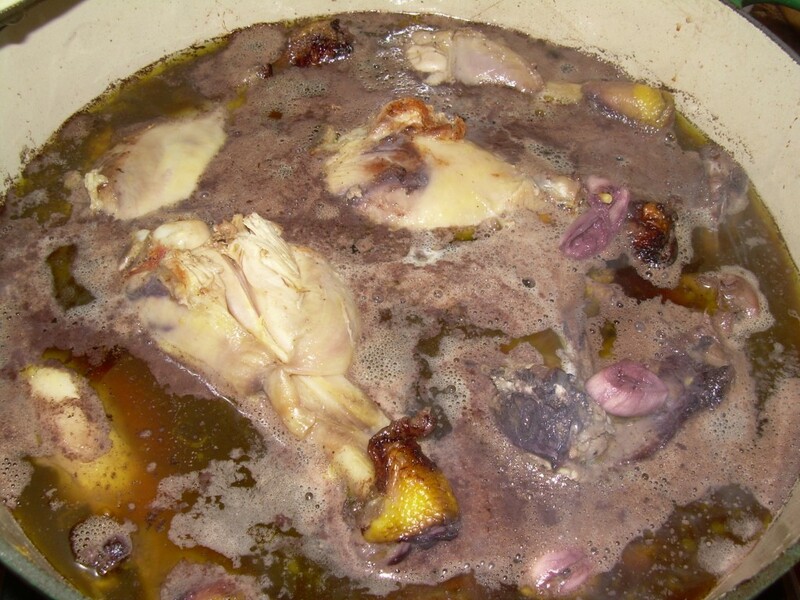 continue reading "Recipes to Rival – Coq au Vin"
Will be up later today! Have to upload some photos when the computer is available. So, what do you do when you just got off the red-eye, you’ve been gone for almost two weeks, and you’re jet-lagged, with a husband to feed? You pull out and thaw the turkey breast that you bought in December. Pat it dry, then drizzle it with olive oil. Then you sprinkle kosher salt, and freshly ground black pepper on the outside and in the cavity. 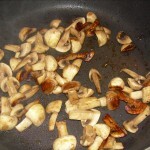 You sprinkle it with garlic powder and . . . oh, back there, waaaaaay in the back of my cupboard is some spice blend by Emeril. You sprinkle that on, too. You quarter an onion and stick it in the cavity, then roast the whole thing at 375 F until done (use a roasting thermometer to be sure – I roast mine to 165 F, and let it rest for about 20 minutes. 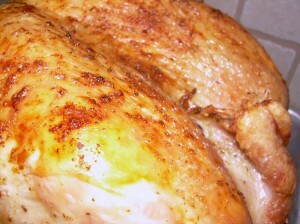 The internal temperature rises to 180 F). This will feed one hungry husband for several days, while you reset your internal clock. Folks, as I’ve mentioned before, things have been mighty hectic. I’m catching up with cooking, reading all of your blogs, and posting. One of the dishes that I actually made on time, but haven’t had a chance to post, was this month’s Recipes to Rival challenge – Steak Diane. In case you’re not familiar with R2R, it’s a small group founded by Temperance of High on the Hog and Lori of Lipsmacking Goodness as a savory alternative to The Daring Bakers. I have to say, every month is a wonderful new culinary adventure with this group, and the recipes are often quite easy, and often involve a dish that I’ve wanted to try but never got around to making. Steak Diane is one of those dishes, chosen by Temperance of High on the Hog and Shawnee of Delishes Delishes. I whipped it together quickly, and served it to my husband who loved it. I didn’t use filet of beef (too pricey), but I did use sirloin. So, I used less meat than the recipe called for, but the full amount of sauce. My husband liked the sauce so much (it failed to ignite for me, but tasted great) that he wants me to use it on chicken. Fine by me! Recipe after the jump (I clarified some instructions based on my experiences), and stop by the R2R blogroll to see how others made out with this dish. 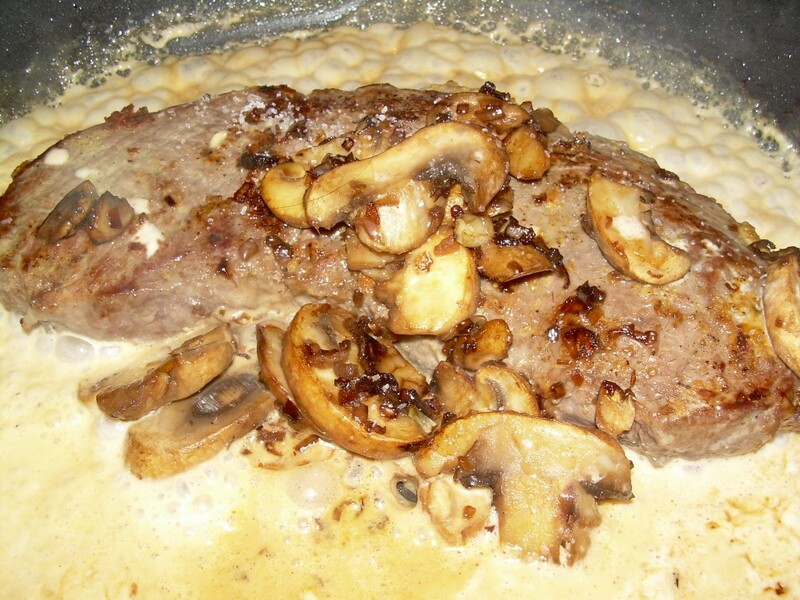 continue reading "Recipes to Rival – Steak Diane Finally Arrives"